MGNT 6020E is a practicum to help transform students into social business consultants and help social ventures to realize their dreams! Students will learn practical skills & knowledge in Social Entrepreneurship, Design Thinking for Social Innovation, Management Consulting and Impact Investing etc. In this action-based learning course, students will learn the cutting edge knowledge in social innovation and essential business skills. They will work in teams to help their social venture partners to ensure sustainability of the business while addressing some social problems at the same time. The best team will win HK$250,000 of grant for its social venture partner to implement the ideas. Upon successful completion of this course, students are expected to understand the current landscape of the social enterprises and venture philanthropy industry. Also, they will acquire hands-on knowledge and practical skills in the areas of management consulting, impact investing and social innovation through their project works. Moreover, they will have the ability to conduct advanced analysis of critical business issues of a social enterprise and conduct basic due diligence. Apart from MBA students, this special course is open to Taught Postgraduate programme students and senior undergraduate students. The course titled is MGNT6020E Selected Topics in Business – Social Entrepreneurship and Impact Investment, bearing 3 credit units offered by the MBA Programmes. For non-MBA students, please apply through the website of Center for Entrepreneurship by 22 August 2018 (Wednesday) 12:00nn. 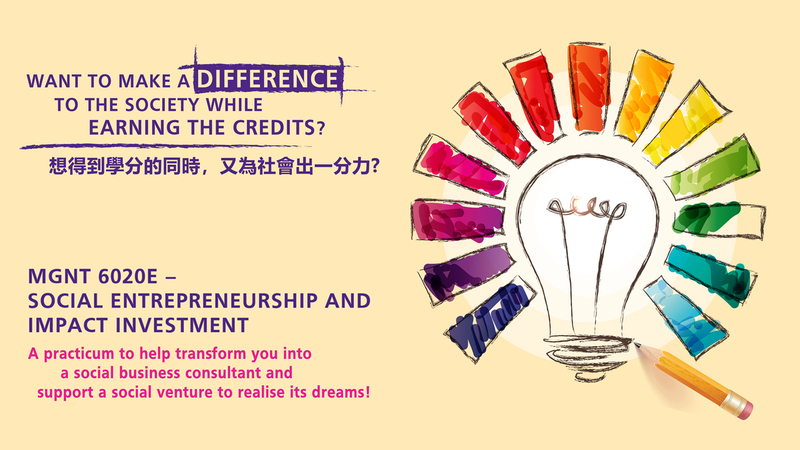 Should you have any enquiries, please contact Ms. Purple Tsoi of Center for Entrepreneurship at 3943 9525. Let’s make the change together… See you in class!